People today are increasingly using their mobiles to find answers to questions and solutions to problems. They are doing this while on the go, and even at work or home. Mobile is with them 24/7, and today, brands simply need to power up their mobile marketing strategy and focus on the Consumer – particularly their Mobile Search marketing to meet their target audiences at their moments of need. Google has defined four key moments when we are online. When a need arises, consumers quickly turn to Search on, say a Google and a YouTube to find a resolution to that need. 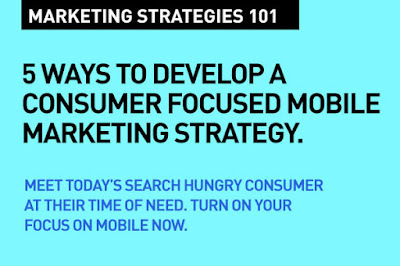 These needs arise when a consumer wants to know something, wants to go somewhere (on a holiday, to a restaurant, to a business location), wants to do something and wants to buy something. Simply put, these are the four basic need states that digital marketing needs to answer. Google calls these 'Micro Moments', and these are real game changers. To start with, you'll need to align with the new thinking that consumer intent is far more relevant than demographics – targeting consumers by their intent at the moment is the new way in digital marketing (see why here). People rely on their mobile devices to get information and inspiration. They literally manage their lives on mobile. 91% of those surveyed (in the US) by Google use mobile for inspiration in the middle of a task. 82% consult their phones while in a store. 66% of consumers consult their phones to learn more about something they saw on a TV commercial. And, 51% have purchased from a company or brand other than the one they intended, because the information they found on Search was useful. So, your brand, your product really needs to meet your target audiences at their moments of need. So, in this search intense, search driven world of how consumers seek out solutions and connect with brands that are able to provide resolution to their needs, how do you be there? Build an effective SEO (Search Engine Optimization) program for your website? (See here for the Basics of Search – Understanding SEO and SEM in 2016). And here's 7 Things you need to bullet proof your SEO. Use content to better market your products and services, to better connect to your target audiences, and engage consumers. Make sure that your content is search friendly – and that the context in which it is delivered is truly relevant. Keep it simple. Use familiar terminology for easy reading, keep paragraphs short and use lists. Readers like lists, quotes and statistics. Include these elements whenever possible. Here are six ways to get your content marketing strategy to work harder for you to deliver great Search results when your audience is looking. YouTube is the world's second most popular search engine. After Google. Your brand really needs to be there when people are looking for solutions to their needs – and are particularly looking for video content. On YouTube, most people look for How To solutions. Encourage User Generated Content on video about your products – count on unboxings, reviews, how-to's and as well populate your online presence with commercials, video posts, and brand videos in general. Your target audience is more likely to click on search results that include a video. Google gives preference to video results on their Result Pages. Today, it's absolutely essential for a brand to be there on social media. Consumers and customers want to be empowered by brands to be connected and be in the know. Social media is where they turn to for that connection and brand engagement. Social media interaction is key – you really cannot engage and interact on your website with your audience as you can on social. Make this your key channel and be relevant. Improve your social media engagement. Move from Selling to building Relationships – this is what will end up giving you a far more robust presence online. Start with keyword analytics. You need to listen to what's being said and build on that. Start with listening, and make this an on going source of what makes up your strategy. Ensure that your owned media content (your website, your blogpost) has all the right keywords that your target consumers would associate with your brand, your product, your vertical, your competitors, your industry. Keep this approach fresh, and constantly evolving, or else your brand or product will simply slide down the results pages. Use hashtags (#) to determine what's being said around your product. Use them in your twitter presence and instagram posts. When your target audience turns to search and is looking for a solution to their need, you need to first be there. Whether in the form of searches, app interactions, mobile site visits, or even YouTube video views, these need based micro-moments happen constantly. Just being there with the right search results, the right content, the right message is key.But get the simple stuff done first. As listed above. That's the basics. That's Digital Marketing 101. Please share this post with your friends and colleagues. This may be just their moment of need! Mobile Marketing: Native App or Responsive Website? Which one's right? This is an insightful article that should help any marketing person understand that today companies really need to shift their focus away from their own needs (to sell their products) to the needs of the consumer. Any success in marketing today must be based on consumer need.